There are a bunch of things I need to add to my charge implementation. It kind of sounds like a simple feature. But the thing with these “oh, it’s just player moving faster for a bit” is all the extra detail that goes into considering all the cases, balancing it, then providing feedback. And I expect I won’t be done with a second pass either. This will stop new charges activating while the cooldown is active. However, holding charge button will charge at the earliest opportunity. This does happen to be the same value as minimum duration for now, but I can tweak it if I want. I am not going to stop the player charging as soon as they get back to this value, that is, I don’t have the sort overheat mechanic mounted guns have in games — “you have to fully cool the gun after you overheat it before shooting”. Besides, the next param will penalize it anyway. Now, all these actually change how charging feels a lot. It makes it much less a spammy ability and more of a “time to charge about for a bit”. I suppose I would need my bosses of enemies do some stuff that forces the player to charge around avoiding projectiles. Speaking of, the charge is currently not very useful other than moving out of the way of projectiles… which the player can do regardless. I think only shotgun is something the player can’t just step away from to dodge. So I have to make the player ignore projectiles when they charge, Matrix-style. Thankfully, I have a custom collision system and every entity can arbitrarily decide what to collide with, so this change is super-simple. The only addition I needed is the special charge variant for the front sprite, which is a bit more usable than the flash background outline. I also want to focus on the remainder of the bar, not the whole bar. I am really short on well-spaced HUD real estate, but oh, well. Actually, I do want to show the numbers. 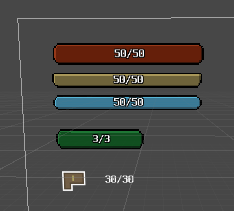 I keep thinking about upgrading and how it adds to the duration and that I really want to show the player these numbers, so it feels like an tangible upgrade instead of some hidden number. There are (so) many things I could prettify about the bar, but I think this is good enough for now. Well, that took longer than expected (story of this game). My features get smaller, blog posts get shorter, yet days get longer. Oh well. Next, I need to focus on the in-world feedback for charge, which is the final required part of charge I will need to take care of. I might need to loo k t my effects and effect bundles first.